Chinese wisteria 'Cooke's Special' mingles with 'Rêve d'Or' roses in designer Michael Bates's Sonoma County, California, garden. In the western China province of Hubei, the much-loved vine that westerners know simply by the scientific name Wisteria is called chiao teng (beautiful vine). In Japan, it’s called Fuji. By any name, this rambunctious climber with lacy green foliage is an exceptional beauty in bloom. Dramatic clusters of flowers in blue, pink, purple, and white can dangle from 1 to 3 feet in length. You can train these twining woody vines as climbers, ground covers, or trees (tree wisterias are often sold already trained). Plants will thrive in any soil that drains well and in every climate zone in the West. Make sure, though, that you have room to grow them: Wisterias are vigorous, even rampant growers. Chinese and Japanese wisterias are the most widely sold types. Silky wisterias, also from Japan, deserve equal attention. These three types have surpassed the southeastern American species (W. frutescens and W. machrostachya), introduced in the 18th century but now seldom planted here. Go for named varieties propagated from cuttings, buds, or grafts; they’ll start blooming within the first couple of years after planting. Avoid buying seedlings (often sold as floribunda white or floribunda blue), cautions wisteria grower Guy Meacham of Rippingale Nursery in Oregon. “They may take 10 to 15 years to bloom, and one has no idea of the quality and quantity of the flowers,” he says. 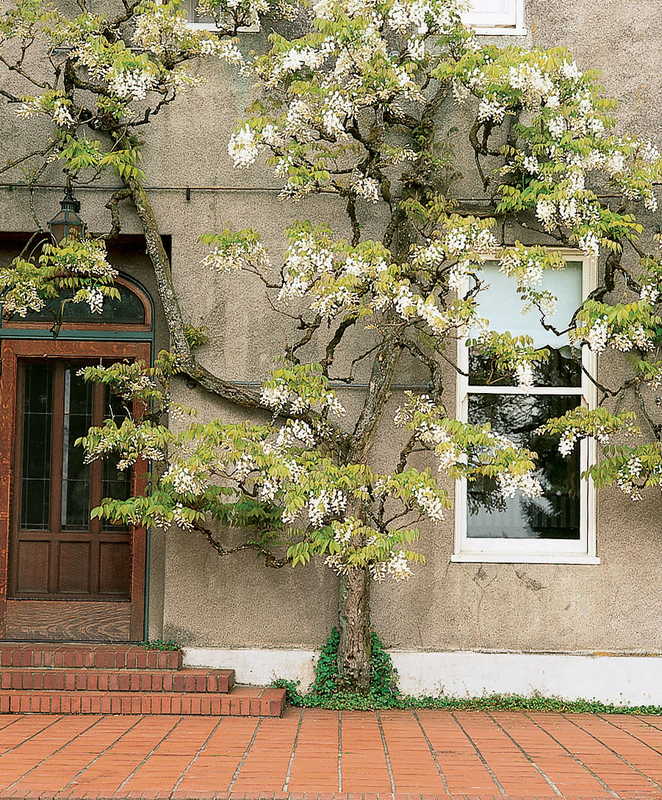 A twice-blooming 85-year-old Chinese wisteria ‘Alba’ is espaliered over a window. Below we list varieties recommended by Guy Meacham or by Peter Valder in his book Wisterias: A Comprehensive Guide (Timber Press, Portland, 1995; $32.95; 800/327-5680). CHINESE VARIETIES (W. sinensis) produce 1-foot-long flower clusters in midspring before foliage expands. Leaves are divided into 9 to 13 leaflets. Chinese wisterias bloom in sun or partial shade. Vines twine counterclockwise. ‘Cooke’s Special’. Clusters of fragrant blue-purple flowers are 20 inches long. The variety can rebloom. It was introduced by a California nursery, L.E. Cooke. ‘Prolific’. Cloaked in dense, blue flower clusters. ‘Prolific’ blooms at a very early age; it flowers sporadically throughout the summer. JAPANESE VARIETIES (W. floribunda) produce dramatic 11/2- to 3-foot-long flower clusters, usually in midspring before or while foliage is expanding. Leaves are divided into 15 to 19 leaflets and turn yellow in fall (except where noted). Flowers of most varieties are scented. Vines twine clockwise. Japanese wisterias are most effective when grown on pergolas so the long flower clusters can hang freely. They bloom best in full sun. ‘Caroline’ (most likely W. floribunda ‘Caroline’, but sometimes sold as W. sinensis ‘Caroline’). Mauve flowers come out in early spring. The variety is fast growing and early flowering. ‘Macrobotrys’ (also known as ‘Longissima’). Grows exceptionally long clusters (sometimes as long as 3 feet) of moderately scented violet-purple flowers. ‘Royal Purple’ (also known as ‘Black Dragon’). Sweetly scented dark purple flowers emerge in midspring. ‘Shiro Noda’ (also sold as ‘Alba’, ‘Longissima Alba’, and ‘Snow Showers’). Blooms in long clusters of densely packed white flowers. In Wisterias, Valder calls the late-flowering ‘Shiro Noda’ “one of the most beautiful of all,” although it has poor autumn color. ‘Violacea Plena’ (also sold as ‘Black Dragon’). Bears double deep purple flowers. It is the only known double. SILKY VARIETIES (W. brachybotrys, also known as W. venusta) produce a profusion of short (6-inch), fat clusters of large, strongly scented flowers that open all at once, usually in midspring when leaves are just opening. Broad leaves with 9 to 13 leaflets have silky hairs. Most vines twine counterclockwise (an exception is noted). Silky wisterias have velvety seed pods and bloom best in full sun. ‘Murasaki Kapitan’ (also sold as ‘Murasaki’ and ‘Violacea’). Profuse blue-violet blooms in early spring. Twines clockwise. ‘Shiro Kapitan’ (also sold as ‘Alba’). ‘Shiro Kapitan’ has white flowers with yellow markings. “Superior in color to the white cultivars of W. sinensis,” notes Valder. Choose a location that allows shoots room to spread. Water newly planted wisterias regularly for the first year or two, until the plant is well established. While plants are young, fertilize twice a year, in early spring and midsummer. Once it is established, water infrequently (more frequently in hot climates). In coastal areas, old vines need little to no supplemental water. 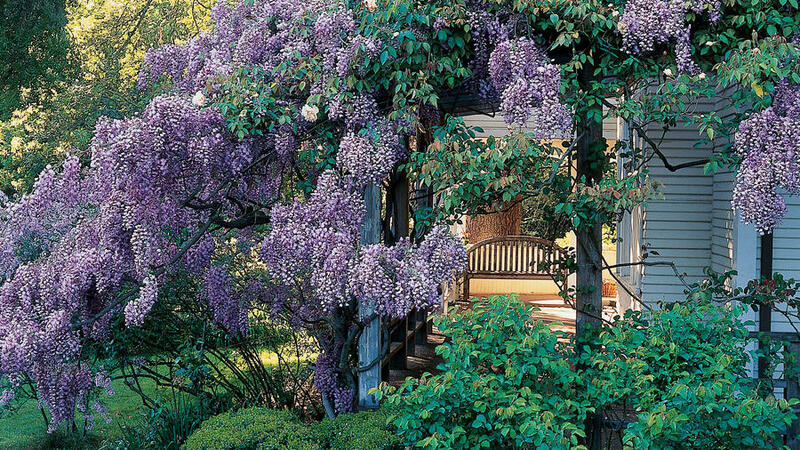 Unless grown as a ground cover or trained as a tree, wisteria needs the strong support of a sturdy pergola or trellis. Pruning is also critical to maintain this vigorous grower. 1. Once the vine has developed its structure, cut back side shoots to two or three buds (count from where shoot originates). Shorten the flower-producing spurs that grow from side shoots to just beyond the last flower bud (flower buds are fatter than leaf buds). 2. Thin any excess shoots by cutting them back to the main stem. 3. Cut back the growing tips to limit length. Cut long, whippy shoots back to three leaves. Do not cut shoots that are needed to extend the vine or fill in gaps. Forestfarm, 990 Tetherow Rd., Williams, OR 97544; (541) 846-7269 or www.forestfarm.com; catalog $5. Sells 19 kinds. Greer Gardens, 1280 Goodpasture Island Rd., Eugene, OR 97401; (800) 548-0111 or www.greergardens.com; catalog free. Sells about 20 kinds.